“Contemplate the mangled bodies of your countrymen, and then say ‘what should be the reward of such sacrifices?’ Bid us and our posterity bow the knee, supplicate the friendship and plough, and sow, and reap, to glut the avarice of the men who have let loose on us the dogs of war to riot in our blood and hunt us from the face of the earth? Speech before the State House of Pennsylvania, Philadelphia, August 1, 1776. “If America fails, a new Dark Age awaits. So the failure of our ‘City on a Hill’ is not an option. No matter how this dangerous world threatens, no matter how cravenly our leaders respond to those threats, we who truly love America and cherish freedom do not have to accept decline. We choose faith, hope, and love of liberty. We choose optimism. We choose to ignite a revolution to restore America—a New Reagan Revolution. 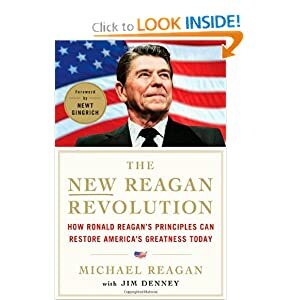 —Michael Reagan, The New Reagan Revolution: How Ronald Reagan’s Principle Can Restore America’s Greatness Today. The Republicans passed HR 437 as an anti-Occupy measure. President Obama signed it to insulate himself from protesters during the 2012 campaign. The Republicans and Democrats have conspired together to criminalize the First Amendment. The ghosts of the founding fathers demand to know why our so-called “leaders” have voided and vacated the rights they bled and died for. Jack: In France, everybody is running on the “what can I give you more of” platform, including Sarkozy. So, unlike all the other countries that got the message, “Hey, we’re broke, they’re rioting in the streets, we’ve got to tighten our belts, the good times are over,” France is completely ignoring that in their presidential election and all the candidates are running on the platform of, “Oh, you want to lower the retirement age from 65 to 62, I want to lower it to 58!” “Oh yeah? Well I want to make it 52! And I want to have a million more teachers on the government payroll.” They’re all running on the bigger government, the “give-people-more-stuff” platform. This guy, François Hollande (of the French Socialist Party), who beat out Sarkozy yesterday, wants to tax the rich, anyone who makes €1 million or more, 75 percent. Jack: The guy to the left of him, who got beat out, wanted to tax the rich—who he defined as anyone making more than €500,000—at a rate of 100 percent. Jack: And he just barely got edged out. And he was advocating a tax of 100 percent of everything over €500,000. Joe: How much effort does he think people are going to put into making money and to create jobs and to grow companies, if the government is going to confiscate 100 percent of their earnings? Screw you. To hell with you, France. If the Germans invade again, we’re just going to watch TV. We’re just going to say, “I don’t hear anything, I don’t see anything,” achtung! Jack: It’s an interesting idea. Because if I make $500,000, and every dollar over that I make, the government gets all that, there are only a couple of options. You’d figure out a way to cheat and hide it somehow, or you’d hire somebody to pretend they’re you and take part of your business. You’d have to do something like that. Joe: Well, you’d find a way to deny the government that revenue. And the vast majority of people would just not put in the effort anymore. You know, the free market has lifted more people out of poverty than anything conceived of by man, bar none. But everyone wants to do away with it in the name of “fairness.” You want fairness? Let the market work. Jack: “A Country in Denial” was the article in The Economist. By ignoring their economic problems, France’s politicians are making it impossible to solve those problems. Everybody still thinks the party is not over. You can still just give people stuff, promise them anything, let them retire early, it’s amazing! It’s really quite amazing. But you know, we’re more or less there in the United States. We’re in not quite as dire a situation as France, because our economy is so good. But we are headed in that direction, and we are still acting like nothing was wrong. Joe: Okay, here’s the calculation that politicians are making. If you don’t deal with politicians as often as we do, you can’t conceive of how cynical they are. The calculation they make is, “Will the ess hit the fan, will the disaster happen during my term?” And if the answer is no by as little as a day, then they will continue doing politics as usual, the pandering, the income redistribution, the overspending—unless it’s going to happen on their watch. And literally, if it’s one day after their power is no longer an issue to them, then they don’t care, they don’t care. They are beating the hell out of our children and we’re letting them. Jack: The vast majority of politicians are cowards who just want to hang onto their job while they’ve got it. Joe: And a majority of Americans don’t pay income tax anyway, so it doesn’t really seem like an issue to them. Jack: France, which is further down the road of being scroomed then we are, the guy who currently leads to become the next president of France, is running on, “I’m going to move the retirement age from 65 to 62, and taxing people who make over €1 million at a rate of 75 percent. Joe: Wow, that’s a kick in the baguette. “Heaven help me, I could not see the far end! The smoke had billowed up and my eyes would barely open and would not focus. So I pushed on, while trying to remember the formula by which one made a deathbed confession and then slid into Heaven on a technicality. The Notebooks of Lazarus Long (1978). “Do not confuse ‘duty’ with what other people expect of you; they are utterly different. Duty is a debt you owe to yourself to fulfill obligations you have assumed voluntarily. Paying that debt can entail anything from years of patient work to instant willingness to die. Difficult it may be, but the reward is self-respect. “Time is your total capital, and the minutes of your life are painfully few. If you allow yourself to fall into the vice of agreeing to such requests, they quickly snowball to the point where these parasites will use up 100 percent of your time — and squawk for more! “So learn to say No — and to be rude about it when necessary. “Otherwise you will not have time to carry out your duty, or to do your own work, and certainly no time for love and happiness. The termites will nibble away your life and leave none of it for you. “What Representative Cummings said was quite interesting because he said it’s a basic tenet of government that it’s not your money. It’s the taxpayers’ money. But he’s missing the point. It’s a basic tenet of human nature that if you’re spending other people’s money you’ll be less careful than you would than with your own. And that’s the central argument against big government. “Apart from the content of the programs or the objective of the programs, it’s a fact that the government exists—parasitically—on the money of the taxpayers, and everything it spends is something that’s been sucked out of the private economy. And intrinsically, that money being spent by a bureaucrat rather than by the person who originally had the money, is going to be spent with more negligence, and more waste, and more disregard for the ultimate good than if it were in the hand of the private citizen. Friedrich Hayek (interviewed by Thomas W. Hazlett) talks about the failed legacy of Keynesianism, November 12, 1978. Clearly, POTUS, like the Ministry of Truth, believes that if you pour syrup on it, then it must be a pancake. Full story at ABC News Political Punch. A very smart man once wrote a very stupid thing in a book. The smart man’s name was Douglas Adams, and the book was his posthumously published The Salmon of Doubt: Hitchhiking the Galaxy One Last Time (New York: Ballantine, 2002; pages 131-132). Adams died of a heart attack in Santa Barbara in May 2001; he was only 49. I’m a longtime fan of Douglas Adams and his Hitchhiker’s Guide to the Galaxy series. But in this instance, Adams’ analogy—known as The Puddle Analogy—is far less profound than he supposed. Imagine a puddle waking up one morning and thinking, “This is an interesting world I find myself in, an interesting hole I find myself in, fits me rather neatly, doesn’t it? In fact it fits me staggeringly well, must have been made to have me in it!” This is such a powerful idea that as the sun rises in the sky and the air heats up and as, gradually, the puddle gets smaller and smaller, it’s still frantically hanging on to the notion that everything’s going to be alright, because this world was meant to have him in it, was built to have him in it; so the moment he disappears catches him rather by surprise. I think this may be something we need to be on the watch out for. Adams begins: “Imagine a puddle waking up one morning and thinking…” He doesn’t seem to realize that, in order for a puddle to wake up and think its first thought, a vast number of interconnected and incredibly unlikely coincidences have to occur. The Big Bang had to happen, and the Big Bang had to explode with just the right amount of force to allow matter to disperse evenly and smoothly and allow galaxies to form. Had the Big Bang not been precisely fine-tuned, our universe might consist of nothing but tenuous hydrogen gas—or a single supermassive black hole. The laws of nature had to be laid down at the instant of the Big Bang, and had to be fine-tuned to an accuracy of one part in the trillions before the universe itself could exist, much less a contemplative puddle. The electromagnetic force, the gravitational force, the strong nuclear force, and the weak nuclear force all had to be perfectly balanced in order for stars to form and begin cooking up the elements needed to make planets—silicon, nickel, iron, oxygen, magnesium, and so forth. Adams’ pensive puddle could not find itself sitting in “an interesting hole” unless the hole was situated on a planet orbiting a star that was part of a galaxy that was created by the incredibly fine-tuned forces and conditions of the Big Bang. And in order for that puddle to wake up one morning and think at all, it would need to be a lot more complex than a mere puddle of water. A thinking puddle would be a very complex puddle. Even if that puddle were comprised of exotic alien nerve cells suspended in a matrix of liquid ammonia, it would certainly need something like lipid molecules and protein structures and nucleic acids in order to become sufficiently evolved as to wake up and contemplate its own existence. Such components require the existence of carbon. And if you know anything about where carbon comes from, you know that carbon doesn’t grow on trees. It is formed in an amazingly fine-tuned process involving the precise placement of a nuclear resonance level in a beryllium atom. Any enlightened plashet would have to conclude that a superintellect had monkeyed with physics, chemistry, and the biological composition of pools and puddles. The rest of Douglas Adams’ scenario, in which “the sun rises in the sky and the air heats up and … the puddle gets smaller and smaller” is meaningless in view of the fact that dozens and dozens of events, forces, and conditions have to interact in a fine-tuned way in order for the sun to exist, the air to exist, the sky to exist, and the hole in the ground to exist, so that a puddle can wake up one morning and wonder about its place in the cosmic order. No analogy is perfect, of course, but The Puddle Analogy is downright misleading. It misrepresents the essence of the fine-tuning argument. An analogy should simplify, but not over-simplify. And that’s why The Puddle Analogy that Richard Dawkins thinks is so brilliant is actually kinda dumb.